Mr Kerry's speech was a clear and powerful statement of the rationale for military action against Syria. The focus was placed entirely upon deterring the Syrian authorities from ever using chemical weapons again. This was neither an intervention in the civil war nor an attempt to topple the Assad regime. Mr Kerry sought to convince a US public that is tired of war that it was Washington's responsibility to act. The message was that there would be no need to wait for the UN inspectors' report; he insisted the report would tell Americans nothing they didn't know already. The stage is set for action. While no final decision has yet been taken to strike, it may only be a matter of days. Since israel has attacked many times before Syria reserves the right to respond so if america starts unilateral action isr will pay the price as well.but america can use its clown states like saudi or qatar aerial missile bombing to trigger an all around Syrian response and play the victim to start the war.In that case i think only the attacking clowns should be crippled and avoid direct confrontation as much as possible with america while sending american clowns back to their caliphs in hell.Also I hope Syria has scuds that can carry cluster or nepalm for static air bases and similar targets.I hope this time the same american dream will be stopped from realising itself again and war wont happen. 1. US turned a blind eye knowingly that Iranians will be slaughtered with chemical weapons. WASHINGTON: The United States provided Iraq with intelligence on preparations for an Iranian offensive during the Iran-Iraq war even though it knew Baghdad would respond with chemical weapons, Foreign Policy magazine reported on Monday. Citing declassified CIA documents and interviews with former officials, the magazine reviewed the US record as Washington weighs military action against Syria for its alleged use of chemical weapons near Damascus last week. The magazine said the US knew in 1983 that Iraqi leader Saddam Hussein would not hesitate to resort to shelling Iranian forces with sarin or mustard gas. “As Iraqi attacks continue and intensify the chances increase that Iranian forces will acquire a shell containing mustard agent with Iraqi markings,” a top secret CIA report said in November 1983. “Tehran would take such evidence to the UN and charge US complicity in violating international law,” the agency warned. In late 1987, US satellite imagery showed that Iran was concentrating a large force east of the southern Iraqi port city of Basra in preparation for a spring offensive. The images also showed that the Iranians had identified a strategic weakness in the Iraqi defenses. The report, titled “At the Gates of Basra,” was shown to president Ronald Regan, who wrote a note in the margins that said, “An Iranian victory is unacceptable,” according to Foreign Policy. The United States decided to inform Baghdad of its findings and help the Iraqis with intelligence on Iranian logistics centers and anti-aircraft defenses. Saddam's forces smashed the Iranian buildup before it could get off the ground, launching a vast offensive in April 1988, backed by bombardments with chemical weapons, on the Fao Peninsula. Chemical agents were used four times, each time killing between hundreds and thousands of Iranian troops, according to the CIA. “The Iraqis never told us that they intended to use nerve gas. They didn't have to. We already knew,” said retired Air Force colonel Rick Francona, a military attache in Baghdad during the 1988 attacks. During the same period, in March 1988, Saddam used chemical agents in an attack of the Kurdish village of Hallabja, killing 5,000 people, also with total impunity. PARIS: French President, Francois Hollande, said on Friday that a military strike on Syria could come by Wednesday. He was of the view that Britain's surprise rejection of armed intervention would not affect his government's stand. In an interview to the Le Monde daily on Friday, Hollande said that France wanted firm action against the Damascus regime. The French leader had earlier vowed to “punish” President Bashar al-Assad’s government for an alleged chemical weapons attack on August 21, which killed hundreds. The president declared that the British Parliament’s withdrawal from the proposed action against Syria would not affect France’s resolve. “Each country is free to choose whether to take part in such an operation or not. That holds true for Britain and France,” he said. He ruled out strikes while inspectors from the United Nations were in Syria investigating the alleged chemical attack. They would leave on Saturday, according to UN Chief Ban ki-moon. The French parliament is due to meet on Wednesday for an emergency Syria session. He declared that the chemical attack could not go unpunished. He further stated that he would have a “meaningful exchange” with the president of the United States (US), Barack Obama on Friday. The US, while reserving the right to act alone, had also stated that it was hoping for an international coalition in Syria. Hollande, however, ruled out strikes while the UN inspectors were in Syria investigating the alleged attack. UN chief Ban Ki-moon has said they were expected to leave Syria by Saturday morning. Also some news that I have post previously about the terrorists chemical bottles. It was later claimed to be anti freeze material but not fully clarified actually at least the explanations did not convince me that it was not sarin that was found on the terrorists. Next move might be detonating those bottles before they retreat from some place inside Syria and claim it over Syrian army then israel can show some made up satellite photos etc. 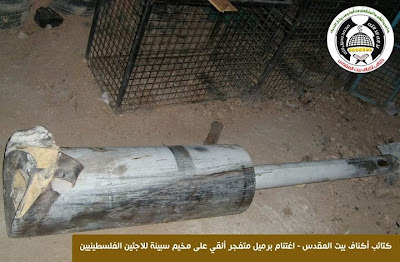 Turkish security forces found a 2kg cylinder with sarin gas after searching the homes of Syrian militants from the Al-Qaeda linked Al-Nusra Front who were previously detained, Turkish media reports. The gas was reportedly going to be used in a bomb. The sarin gas was found in the homes of suspected Syrian Islamists detained in the southern provinces of Adana and Mersia following a search by Turkish police on Wednesday, reports say. The gas was allegedly going to be used to carry out an attack in the southern Turkish city of Adana. On Monday, Turkish special anti-terror forces arrested 12 suspected members of the Al-Nusra Front, the Al-Qaeda affiliated group which has been dubbed "the most aggressive and successful arm” of the Syrian rebels. The group was designated a terrorist organization by the United States in December. Police also reportedly found a cache of weapons, documents and digital data which will be reviewed by police. Following the searches, five of those detained were released following medical examinations at the Forensic Medicine Institution Adana. Seven suspects remain in custody. Turkish authorities are yet to comment on the arrests. in possession of sarin gas. inadmissible,” Russian Foreign Ministry spokesman Alexander Lukashevich said on Thursday. In a separate incident in Adana, police reportedly received intelligence that an explosive-laden vehicle had entered the town of Adana on Thursday, the Taraf daily reports. Ankara has attempted to bolster the Syrian opposition without becoming embroiled in the Syrian civil war, a policy which Damascus claims lead to the deadliest act of terrorism on Turkish soil. On May 11, 51 people were killed and 140 injured after two car bombs exploded in the Turkish town of Reyhanl&#305;, located near the country’s border with Syria.A dozen Turkish nationals have been charged in the twin bombings, and Ankara has accused Damascus of helping the suspects carry out the attack. "This incident was carried out by an organization which is in close contact to pro-regime groups in Syria and I say this very clearly, with the Syrian Mukhabarat [intelligence agency]," Interior Minister Muammer Guler said. Syria’s Information Minister Omran Zoubi denied any link the attack, saying his country "did not commit and would never commit such an act because our values would not allow that".Zoubi further charged the Turkish government had facilitated the flow of arms, explosives, funds and fighters across the country’s border into Syria, claiming that that Turkish Prime Minister Recep Tayyip Erdogan and his party bear direct responsibility [for the attack]." Reports of chemical weapons use by both Damascus and the Syrian opposition have surrounded the conflict in Syria for months. In March, the Syrian government invited the United Nations to investigate possible chemical weapons use in the Khan al-Assal area of rural Aleppo. Military experts and officials said a chemical agent, most likely sarin, was used in the attack which killed 26 people, including government forces. Damascus claimed Al-Qaeda linked fighters were behind the attack, further alleging Turkey had a hand in the incident. “The rocket came from a placed controlled by the terrorist and which is located close to the Turkish territory. One can assume that the weapon came from Turkey,” Zoabi said in an interview with Interfax news agency. US President Barack Obama has warned any confirmed use of chemical weapons by Damascus would cross a "red line" which would prompt further action. Both Washington and London claimed there was growing evidence that such chemical agents had been used. Less clear perhaps is whether a similar red line would apply to Syrian opposition groups such as Al-Nusra by the US and NATO allies. Author and historian Gerald Horne, for one, told RT that there are greater political dynamics at work. “Well, one would think so, but of course we know that the United States along with its NATO partners Britain and France are quite close to the main backers of the rebels -- I’m speaking of Saudi Arabia and Qatar. We know, for example, according to the Financial Times that Mr Sarkozy, the former president of France, is in very close financial relationship with the Qataris,” says Horne. That would be under the existing paragraph in the story: US President Barack Obama has warned any confirmed use of chemical weapons by Damascus would cross a "red line" which would prompt further action. Both Washington and London claimed there was growing evidence that such chemical agents had been used. This case being similar to an earlier one, with the findings of UN chemical weapons expert Carla Del Ponte - who had found evidence of their use by the rebels – some think the fallout will be what it was then as well. Journalist and RT contributor, Afshin Rattansi believes that the same fate will befall this story, as far as media coverage goes. All possible doubts will either be hushed or directed elsewhere, as they were toward Del Ponte’s findings. The Independent International Commission of Inquiry on Syria, said there were “concrete suspicions but not yet incontrovertible proof of the use of sarin gas” in Syria. "This was use on the part of the opposition, the rebels, not by the government authorities," Del Ponte continued. Exposure to large quantities of sarin gas, whose production and stockpiling was outlawed by the Chemical Weapons Convention of 1993, causes convulsions, paralysis, loss of respiratory functions and potentially death. BEIRUT, Lebanon — President Obama says he is seeking Congressional approval for a “limited, narrow” military strike against Syria — an aim that many Middle East experts fear overlooks the potential to worsen the violence in Syria and intensify a fight for regional influence between Iran and Saudi Arabia. Supporters of the president’s proposal contend that a limited punitive strike can be carried out without inflaming an already volatile situation. But a number of diplomats and other experts say it fails to adequately plan for a range of unintended consequences, from a surge in anti-Americanism that could bolster Syria’s president, Bashar al-Assad, to a wider regional conflict that could drag in other countries, including Israel and Turkey. “Our biggest problem is ignorance; we’re pretty ignorant about Syria,” said Ryan C. Crocker, a former ambassador to Syria and Lebanon, who has served in Iraq and Afghanistan and is dean of the Bush School of Government and Public Service, Texas A&M University. The American strike could hit President Assad’s military without fundamentally changing the dynamic in a stalemated civil war that has already left more than 100,000 people dead. At the same time, few expect that a barrage of cruise missiles would prompt either side to work in earnest for a political settlement. Given that, the skeptics say it may not be worth the risks. “I don’t see any advantage,” said a Western official who closely observes Syria. In outlining its plans, the Obama administration has left many questions unanswered. Diplomats familiar with Mr. Assad say there is no way to know how he would respond, and they question what the United States would do if he chose to order a chemical strike or other major retaliation against civilians. For the United States, the challenge is to deliver the intended message to Mr. Assad without opening the door to a takeover by rebels linked to Al Qaeda, the collapse of state institutions, or a major escalation by Syria’s allies. Skeptics doubt that the United States — or anyone else — has the information to calibrate the attack that precisely. That is partly because the United States is preparing to inject itself into a conflict that is no longer just about Syria, but has become a volatile regional morass that pits Iran and Hezbollah, the Shiite militant group in Lebanon, against Qaeda affiliates backed by Saudi Arabia and other Persian Gulf benefactors. Iran’s and Syria’s defense ministers threatened on Friday to unleash attacks on Israel if Mr. Assad was in danger. While Hezbollah has said it would wait to see the scale and nature of the attacks before responding, in practice, analysts close to the organization said, it is probably prepared for any contingency. There is also concern that Shiite-led Iraq could send thousands more militants to help Mr. Assad if it believed he was truly threatened, and that such a step would in turn further rally and embolden Sunni jihadists on both sides of its border with Syria. Many diplomats and analysts consider retaliation unlikely, but the consequences could be grim. Israel has vowed that if Hezbollah attacks it again, it will respond forcefully, drawing Lebanon into war. And if Syria lobbed missiles into Israel and it responded with airstrikes through Lebanese airspace that threatened Mr. Assad further, Hezbollah would consider that further justification to attack Israel. Even without such a direct entanglement, Lebanon could be very vulnerable. It has recently suffered its worst sectarian violence in years: a car bomb in Shiite Hezbollah territory in the Beirut suburbs, and two at Sunni mosques in the northern city of Tripoli. Lebanese authorities accused Syria on Friday of involvement in the Tripoli attacks, and intelligence officials fear such bombings could increase. Within Syria, there is also the prospect of civilian casualties, either from errant American missiles or among people near the target sites. The Syrian government has put some military bases in populated areas, and thousands of political and other prisoners are held in security buildings. Although the strikes are said to be aimed at elite units involved in chemical weapons use, Reuters reported Friday that many Sunni conscripts have been effectively imprisoned on bases because they are not trusted, leaving them vulnerable, too. Significant casualties among the very people American officials say they are protecting could be exploited by the government. “That will completely empty any justification for this” in the eyes of many, the Western official said. Some likely targets are in areas that up to now have remained relatively secure, including the corridor from western suburbs of Damascus to the Lebanese border. And in Damascus itself, a bubble of relative security, residents have expressed fear that in the aftermath, clashes could erupt. That could create a new humanitarian crisis and new refugee flows to Syria’s already burdened neighbors. American officials say they do not expect a refugee crisis because of the strikes’ limited nature, but Human Rights Watch has called on them to plan for the unexpected. “We haven’t received any indication that plans for beefed-up humanitarian response are under way,” said Lama Fakih, the group’s deputy director in Beirut. Anger over American involvement could also undo one of the major benefits to American interests from the Arab uprisings by restoring the alliance against Israel that Iran, Syria and Hezbollah had with the Sunni Palestinian group Hamas. The conflict in Syria has sorely tested that alliance, with Hamas supporting the Sunni-led Syrian rebellion. Verifying information in Syria is extraordinarily hard, and another risk, however remote it may seem to American officials, is that it turns out that the Assad government was not responsible for the chemical attack. In any case, in a region where many have their doubts after the faulty intelligence that led to war in Iraq, wide sectors of the public may remain unconvinced. That would allow Mr. Assad to paint himself as the victim of an unjust American intervention and draw more supporters back to his fold. Bashar al-Assad challenged the West to provide "the slightest proof" he has used chemical weapons against his people in his first reaction to allegations that his forces killed more than 1,400 people in a gas attack on August 21. There seems to be various attempts right now after Syria gave out the potential target list again they start their victim propaganda. Of course if america attacks all american bases that can launch their warplanes will be legitimate potential targets for Syria to defend itself since their airforce is quite large Syria will respond with full force to defend itself and Syria by giving warnings creates the deterrence showing the costs right now so no whining after illegitimate threats of extermination. Another thing after so many lies, the chemical bottles on saudi-qatari bred terrorists, chemical missile attack against Syrian army and now this backfired Us might change words like say especially after they understand that they can't wage war that they just wanted to force Syria to table etc. "diplomatically". If they can attack they do attack like they did in Iraq if it is too costly for them and especially for israel they can't attack everyone knows that by now and Syria will continue its struggle as always and legitimate ways to come to agreement like Geneva conference etc. are all pursued it is the opposition that always does false flags like these every time the negotiation dates gets near. No matter the consequence everyone is now aware of americas true identity the source of its power, being the force of lies and when one directs to see the truth behind it is weak. ...bro you're making it too easy. Caliph is something family of saud fears most..
President Barack Obama has won backing from key US political figures on his plans for a military strike on Syria. Mr Obama said a "limited" strike was needed to degrade President Bashar al-Assad's capabilities, in response to a chemical weapons attack in Syria. Key Republican leaders John Boehner and Eric Cantor both signalled their support for military action. Congress is expected to vote next week. New footage from September 3, 2013 shows militants from the "Free Syrian Army" (FSA) using blue canisters/cylinders filled with an unknown gas mounted on top of shells fired on Syrian Army targets in different areas of Aleppo that are still under the control of the Syrian military. President Vladimir Putin has said Russia could agree to back military action in Syria if the UN received proof that Bashar al-Assad's regime had used chemical weapons against its citizens. What the WMD attack in Syria did do… is expose the presence of a series of facilities whose “output” makes Sarin gas look like child’s play. The labs are real, just as real as NSA spying. Recently, they manufactured what may well lead to a world war over Syria. Recent chemical warfare attack in Syria has led investigators to a decade-old network of secret labs spread from the Caspian Basin to the Baltic. The story of these facilities may well overshadow years of unimaginable horrors, torture, secret prisons, massive spying and the orchestrated destruction of world economies. With widely respected political leaders in the US, Senator Ron Paul, Congressman Alan Grayson, Pat Buchanan and even Zbigniew Brzezinski either declaring recent chemical attacks a false flag or voicing total skepticism over US involvement, wider issues of nightmarish American secret labs are being suppressed. “I learned back in 2004 about the Bechtel National Project, bio storage facility in Georgia, from US Defense contractors, including Turkish, of the lab facility being constructed near the Tbilisi airport. I soon learned that US government and the Department of Defense, DoD, wanted to study new infectious strains, such as Anthrax, which were evolving in the wild amongst cattle herds in the rural regions of Georgia. It should be mentioned that this small country and Tbilisi was once center-stage to the Soviet Union’s system of bio weapons research, for both animal and plant warfare. I have been able to access the design plans for the facility and speaking to contractors, whistleblowers, have learned that in fact the network of labs in Georgia is operated by the US Department of Defense and has an offensive capacity. Some even go so far as to claim that the US government is using Georgia and its population as part of the on-going research. I also suspected this and am trying to obtain solid proof of this allegation right now. This raises the question whether or not Georgians are being utilized for sinister bio programs and vaccine field trails. This may be difficult to prove, but even the United States has experimented on its own population over the years, and it can use the population of Georgia as part of field trials for vaccines, and without their full informed consent. I became aware of operations in the region in 2005 when former top CIA officials set up operations in the region. Though they had publicly “left” the CIA, they had, in reality, set up a new “privatized” CIA, one supported by a virtual army of private contractors staffed by top CIA specialist drawn into the private sector, gutting the real CIA and setting up an unaccountable organization tasked with developing advanced genetic based bio-weapons, vaccines capable of inducing “time bomb” diseases or “suicidal compulsions” and managing the world’s heroin supply, from production in Afghanistan to distribution, some through Global Hawk UAVs capable of flights around the world. One such bioweapons facility is currently under construction in Kazakhstan, outside Almaty. Salon wrote about it. Nobody paid attention. Others are in Georgia, Bulgaria, Romania, Slovenia and Poland. One is in Libya, built in 2006 with US funds, reported by Wikileaks. Supplying simple nerve gas for Syria was nothing. Dr. David Kelly’s “suicide” can be credited to this organization. So can the “street crime” killing of John Wheeler III. Dozens of other scientists have been murdered that have had ties to this organization. Michael Hastings may well have been a victim also. In July 2010, Veterans Today published the names of 50 WMD scientists who had been murdered or died under “less than credible” accidents or “natural” causes. There are going to be few whistleblowers from these programs, retirement or resignation is a death sentence, this has been seen, has been confirmed and inexorably observed. Others involved are blackmailed or bought, corporate boards or even appointed heads of banks. We are in the middle of a global weapons race, far worse than the worst fears of nuclear proliferation. These aren’t battlefield weapons, the scientific output of these labs and the institutes that support them are, at best Malthusian and more than Orwellian. The future planned for by Project for a New American Century had nothing to do with controling oil or spreading ideology. We are already manipulating weather. We have, for many decades, been creating crop diseases and patenting genetically modified plants containing compounds whose long-term effects serve an agenda that has nothing to do with human food supply. We are, in actuality, not just “patenting” disease but the ability to modify humans, inducing behaviors, subservience to authority, aggression on demand and early death, disease, suicide, when no longer of use. A little Sarin gas to help “political friends” deal with the “inconvenience” of Assad’s military successes in Syria is only an afterthought. Diseases capable of spreading global pandemics are “old hat.” The move now is terra-forming, a subject well beyond geopolitics and social engineering. Targeted populations with certain genetic traits can simply be targeted, shortened lifespans or diminished fertility. Depleted uranium use is part of this process. So is the series of inoculations or vaccinations given American soldiers. After each war, America’s military suffers a “die off” much like that of the dinosaurs. Increasingly, serious scientists are revisiting the possibility that AIDS may well have been an experiment in biology and social engineering. We have had over the years and will continue to see outbreaks of virulent but unidentified diseases quickly decimate small regions, burning themselves out based on vector analysis. Animal populations will disappear, such as with John Wheeler III’s issue with mysterious bird “die offs” just prior to his death. Not too long ago, former Secretary of Treasury Timothy Geithner “disappeared’ several trillion dollars. Where did they money go? Around the world, facilities are being built for no know reasons, some “intelligence fusion centers,” some massive underground bases, those in Israel were reported, the 5 plus dozen inside the US are still very secret. Billions, perhaps even trillions, is spent on esoteric research, “non-ordinary” technology, mind control through quantum physics or energy sources, developed, perfected, engineered but never adapted for any known endeavor that serves humanity. Twenty years ago, nuclear weapons development “went dark,” weapons that emit no radiation, weapons so small, a dozen could fit in a carry-on bag. In Syria, a huge mistake was made. One of the secret weapons labs inside the Republic of Georgia supplied weaponized Sarin gas to forces fighting the Assad regime. The purpose was simple. This was the only way to put “blood enemies” like Senator’s Graham and McCain in concert with the Obama administration. People talk but no one really knows why Obama would allow himself to be placed in such a situation. We see the signs of a global intrigue involving Russia and China. It is as though Obama believes an act as insane as attacking Syria is, somehow, going to save the world from being overrun by nations actually worse than the United States. However, on close examination, there is no reliable evidence that such nations actually exist. What the WMD attack in Syria did do, however, is expose the presence of a series of facilities whose “output” makes Sarin gas look like child’s play. They can do worse. The people who fund them, who run them, who had them constructed and oversee their nightmarish purpose do not believe in the survival of the human race. David Cameron today urged the US to bomb the Syrian regime, claiming there was a risk of a civilian “Armageddon” if the use of chemical weapons went unpunished. He said the whole world had agreed a “red line” against the use of chemical weapons. “I didn’t set a red line — the world set a red line,” he said. Tensions in the Middle East soared as Russia dispatched a large missile cruiser to the Mediterranean in what was seen as a riposte to Israel and America test-firing a missile yesterday. The cruiser, Moskva, bristling with weaponry, will be joined by a destroyer from Russia’s Baltic fleet and a frigate from the Black Sea fleet, tasked with “protecting national interests”. It will arrive days before the US intends to start action to degrade Assad’s regime. Earlier, Russian President Vladimir Putin warned America that any attacks would be “an aggression” unless endorsed by a United Nations resolution and warned that Russia had “plans” on how to respond to such a an event. US sprayed Agent Orange during the Vietnam War. The United States has deployed its CBW arsenal against the Philippines, Puerto Rico, Vietnam, China, North Korea, Vietnam, Laos, Cambodia, Cuba, Haitian boat people and Canada, plus exposure of hundreds of thousands of unwitting US citizens to an astonishing array of germ agents and toxic chemicals, killing dozens of people. The US experimentation with bio-weapons goes back to the distribution of cholera-infect blankets to American Indian tribes in the 1860s. In 1900, US Army doctors in the Philippines infected five prisoners with a variety of plague and 29 prisoners with Beriberi. At least four of the subjects died. In 1915, a doctor working with government grants exposed 12 prisoners in Mississippi to pellagra, an incapacitating disease that attacks the central nervous system. After World War I, the United States went on a chemical weapons binge, producing millions of barrels of mustard gas and Lewisite. Thousands of US troops were exposed to these chemical agents in order to “test the efficacy of gas masks and protective clothing”. The Veterans Administration refused to honor disability claims from victims of such experiments. The Army also deployed mustard gas against anti-US protesters in Puerto Rico and the Philippines in the 1920s and 1930s. In 1931, Dr. Cornelius Rhoads, then under contract with the Rockefeller Institute for Medical Investigations, initiated his horrific Puerto Rico Cancer Experiments, infecting dozens of unwitting subjects with cancer cells. At least thirteen of his victims died as a result. Rhoads went on to head the US Army Biological Weapons division and to serve on the Atomic Energy Commission, where he oversaw radiation experiments on thousands of US citizens. In memos to the Department of Defense, Rhoads expressed his opinion that Puerto Rican dissidents could be “eradicated” with the judicious use of germ bombs. In 1942, US Army and Navy doctors infected 400 prisoners in Chicago with malaria in experiments designed to get “a profile of the disease and develop a treatment for it.” Most of the inmates were black and none was informed of the risks of the experiment. Nazi doctors on trial at Nuremberg cited the Chicago malaria experiments as part of their defense. At the close of World War II, the US Army put on its payroll, Dr. Shiro Ishii, the head of the Imperial Army of Japan’s bio-warfare unit. Dr. Ishii had deployed a wide range of biological and chemical agents against Chinese and Allied troops. He also operated a large research center in Manchuria, where he conducted bio-weapons experiments on Chinese, Russian and American prisoners of war. Ishii infected prisoners with tetanus; gave them typhoid-laced tomatoes; developed plague-infected fleas; infected women with syphilis; performed dissections on live prisoners; and exploded germ bombs over dozens of men tied to stakes. In a deal hatched by Gen. Douglas MacArthur, Ishii turned over more than 10,000 pages of his “research findings” to the US Army, avoided prosecution for war crimes and was invited to lecture at Ft. Detrick, the US Army bio-weapons center in Frederick, Maryland. In 1950 the US Navy sprayed large quantities of serratia marcescens, a bacteriological agent, over San Francisco, promoting an outbreak of pneumonia-like illnesses and causing the death of at least one man, Ed Nevins. A year later, Chinese Premier Chou En-lai charged that the US military and the CIA had used bio-agents against North Korea and China. Chou produced statements from 25 US prisoners of war backing him his claims that the US had dropped anthrax contaminated feathers, mosquitoes and fleas carrying Yellow Fever and propaganda leaflets spiked with cholera over Manchuria and North Korea. From 1950 through 1953, the US Army released chemical clouds over six US and Canadian cities. The tests were designed to test dispersal patterns of chemical weapons. Army records noted that the compounds used over Winnipeg, Canada, where there were numerous reports of respiratory illnesses, involved cadmium, a highly toxic chemical. In 1951 the US Army secretly contaminated the Norfolk Naval Supply Centerin Virginia with infectious bacteria. One type was chosen because blacks were believed to be more susceptible than whites. A similar experiment was undertaken later that year at Washington, DC’s National Airport. The bacteria was later linked to food and blood poisoning and respiratory problems. Savannah, Georgia and Avon Park, Florida were the targets of repeated Army bio-weapons experiments in 1956 and 1957. Army CBW researchers released millions of mosquitoes on the two towns in order to test the ability of insects to carry and deliver yellow fever and dengue fever. Hundreds of residents fell ill, suffering from fevers, respiratory distress, stillbirths, encephalitis and typhoid. Army researchers disguised themselves as public health workers in order to photograph and test the victims. Several deaths were reported. In 1965 the US Army and the Dow Chemical Company injected dioxin into 70 prisoners (most of them black) at the Holmesburg State Prison in Pennsylvania. The prisoners developed severe lesions which went untreated for seven months. A year later, the US Army set about the most ambitious chemical warfare operation in history. From 1966 to 1972, the United States dumped more than 12 million gallons of Agent Orange (a dioxin-powered herbicide) over about 4.5 million acres of South Vietnam, Laos and Cambodia. The government of Vietnam estimated the civilian casualties from Agent Orange at more than 500,000. The legacy continues with high levels of birth defects in areas that were saturated with the chemical. Tens of thousands of US soldiers were also the victims of Agent Orange. In a still classified experiment, the US Army sprayed an unknown bacterial agent in the New York Subway system in 1966. It is not known if the test caused any illnesses. A year later, the CIA placed a chemical substance in the drinking water supply of the Food and Drug Administration headquarters in Washington, DC. The test was designed to see if it was possible to poison drinking water with LSD or other incapacitating agents. In 1969, Dr. D.M. McArtor, the deputy director for Research and Technology for the Department of Defense, asked Congress to appropriate $10 million for the development of a synthetic biological agent that would be resistant” to the immunological and therapeutic processes upon which we depend to maintain our relative freedom from infectious disease”. In 1971 the first documented cases of swine fever in the western hemisphere showed up in Cuba. A CIA agent later admitted that he had been instructed to deliver the virus to Cuban exiles in Panama, who carried the virus into Cuba in March of 1991. This astounding admission received scant attention in the US press. In 1980, hundreds of Haitian men, who had been locked up in detention camps in Miami and Puerto Rico, developed gynecomasia after receiving “hormone” shots from US doctors. Gynecomasia is a condition causing males to develop full-sized female breasts. In 1981, Fidel Castro blamed an outbreak of dengue fever in Cuba on the CIA. The fever killed 188 people, including 88 children. In 1988, a Cuban exile leader named Eduardo Arocena admitted “bringing some germs” into Cuba in 1980. Four years later an epidemic of dengue fever struck Managua, Nicaragua. Nearly 50,000 people came down with the fever and dozens died. This was the first outbreak of the disease in Nicaragua. It occurred at the height of the CIA’s war against the Sandinista government and followed a series of low-level “reconnaissance” flights over the capital city. In 1996, the Cuba government again accused the US of engaging in “biological aggression”. This time it involved an outbreak of thrips palmi, an insect that kills potato crops, palm trees and other vegetation. Thrips first showed up in Cuba on December 12, 1996, following low-level flights over the island by US government spray planes. The US was able to quash a United Nations investigation of the incident. At the close of the Persian Gulf War, the US Army exploded an Iraqi chemical weapons depot at Kamashiya. In 1996, the Department of Defense finally admitted that more than 20,000 US troops were exposed to VX and sarin nerve agents as a result of the US operation at Kamashiya. This may be one cause of Persian Gulf War Illness, another cause is certainly the experimental vaccines unwittingly given to more than 100,000 US troops. What is Caliphat ? What does it mean really ? Will these rebels be able to do anything good ? Or will they be a new Assad ? Does a group who received funds and weapons from kafirs can be ruler of Caliphat ? Are you going to give your allegiance to him? MPs demanded an explanation from government ministers Monday after finding out that the UK granted licenses to export chemicals to Syria that could have been used to produce nerve gas. The licenses were granted on the eve of the Syrian civil war. Export licenses for sodium fluoride and potassium fluoride were granted in January 2012, in the full knowledge that both substances “could also be used as precursor chemicals in the manufacture of chemical weapons,” according to a report published by the House of Commons Committee on Arms Export Controls in July. Angus Robertson, a Scottish National Party MP, told RT that the issue was raised in the House of Commons during defense questions on Monday after unrest surrounding the issue bubbled over the weekend. “Defense ministers had to explain why it was that the UK would even consider granting an export license,” he said, adding that it was "impossible to tell" whether rebels could have got hold of the chemicals should they have made it into the country. Both sodium fluoride and potassium fluoride are capable of being used in the production of sarin, a neurotoxic gas. Large doses of sarin can lead to paralysis, loss of consciousness, convulsions and respiratory failure, eventually resulting in death. “This is why they are included on the Australia Group chemical weapons precursors list and are listed in Annex I of Council Regulation 428/2009, meaning a licence is required for their export from the EU,” the report said. In the 1950s, the US and the USSR produced sarin gas for military purposes, and Syria has fallen under suspicion of owning Soviet-made supplies. US Secretary of State John Kerry alleged on Sunday that it was used in the attack in the eastern Damascus suburb of Ghouta on August 21 in which several hundred people were thought to have died. The accusation came as the UN is still far from finishing testing the samples they collected at the site of the alleged attack. On Monday, the British government gave an explanation as to why an export license was granted for the passage of chemicals that were supposedly bound for a company based in Syria. “We issued licenses for sodium fluoride and potassium fluoride. The exporter and recipient company demonstrated that the chemicals were for a legitimate civilian end-use, which was for metal finishing of aluminum profiles used in making aluminum showers and aluminum window frames,” Oliver Fry, a spokesperson from the UK’s Department for Business, Innovation and Skills, told RT via e-mail. It remains unclear exactly who was to receive the shipments as the company they were being supplied to has stayed anonymous. “I’m still concerned, however, as the chemical licenses were issued at a time when the situation in Syria had already deteriorated,” said Robertson. However the shipment never reached the Arab country. The EU later imposed new sanctions, with licenses being revoked in July 2012. “The sanctions included prohibitions on the sale, supply, transfer or export of certain dual-use items and chemicals (including sodium fluoride and potassium fluoride) which might be used for internal repression or in the manufacture of items which might be used for internal repression,” the House of Commons Committee on Arms Export Controls report stated. The potential of the chemicals is undisputed. “Fluoride is key to making these munitions,” Professor Alastair Hay, an expert in environmental toxicology at Leeds University, told the Daily Record on Sunday. However, it is unknown whether they were a contributing factor. “Whether these elements were used by Syria to make nerve agents is something only subsequent investigation will reveal,” Hay said. The dichotomy between UK claims and actual practice were highlighted by Mark Bitel of the Campaign Against Arms Trade (Scotland). “The Government is hypocritical to talk about chemical weapons if it’s granting licences to companies to export to regimes such as Syria,” he said. MP Angus Robertson echoed the sentiment on Monday. He added that the UK had a dubious track record in providing potentially lethal equipment overseas. “The UK has form in this sort of thing – being prepared to sell military hardware and other things that can be used for the production of weapons, and in this case chemicals which could – in circumstances – be used to produce chemical weapons. And we do have to ask ourselves why with the situation already having deteriorated so badly that the UK was even prepared to grant an export license where these chemicals do have a potential dual use. Yes, for manufacturing purposes, but also for the production of chemical weapons,” said Roberstson. Recently isr tested a bm ofcourse for a possible nuclear strike.Syrian chemical weapons are there for deterrance against israeli nukes.the chem scenario also happened before and will happen as long as terrorists get chat ms from nearby countries and try again and again.A solution seems to be replacing chems with Russian nuke tippediskandar bms short range and only for isr.this way since no cems exist on Syrian inventory it would be futile for terrorists to use their bottles for false flag.everyone will understand there wont be a military solution and Syria wont lose deterrance against isr wmds.america can bark all the way that it is planned but it is them who brought all this.command of the nukes can be jointly made with Russia just like in Turkey and missiles can be stationed close to Tartus base. Do you think at this point the Russians would actually go for something like that? why does Obama support the syrian opposition? If its a true caliphate then all of us are obliged to give allegiance. But Shias will of course refuse because their 12th Imam who came 1000yrs ago went into hiding to preserve their false belief and will allegedly come back as the Mahdi because in the 12th Imam lifetime he couldnt prove he is the Mahdi. Vladimir Putin has warned the US against launching military action in Syria, stating that Russia has "plans" on how it would react if such a scenario unfolded. MOSCOW, September 4 (RIA Novosti) – A new group of ships from Russia’s Black Sea Fleet will join the country’s Mediterranean task force within days, a high-ranking Defense Ministry source told RIA Novosti Wednesday. The task force currently includes vessels from the Pacific, Northern, Baltic and Black Sea fleets: the destroyer Admiral Panteleyev, the large amphibious landing ships Admiral Nevelsky and Alexander Shabalin, the frigate Neustrashimy, and a number of support and auxiliary vessels. The new group includes the large amphibious landing ships Novocherkassk and Minsk and the electronic intelligence ship Priazovye. It will relieve the current task force as soon as it passes through the Bosporus and Dardanelles Straits, which is expected Thursday or Friday, the source said. A high-ranking representative of the General Staff told RIA Novosti the Slava class guided missile cruiser Moskva, which is currently in the Atlantic, will arrive in the Mediterranean on September 17, adding that operational command will then be transferred from the Admiral Panteleyev to the Moskva. Two guided missile corvettes, Shtil and Ivanovets (Nanuchka 3 and Tarantul class respectively) will arrive in the area on September 29, the General Staff said. The Defense Ministry source earlier said there are also plans to send another two Black Sea Fleet warships - the Kashin class frigate Smetlivy and the Alligator class large amphibious landing ship Nikolai Filchenkov. World leaders are venting over Syria’s civil war but look no closer to agreeing on international military intervention to stop it. A French official says leaders at a summit of the Group of 20 leading world economies in Russia agreed with President Barack Obama and French President Francois Hollande that chemical weapons had been used in an Aug. 21 attack in Syria, and condemned it. But many leaders remain in doubt about whether Syrian President Bashar al-Assad’s regime was behind the attack, or Syria’s rebels. The U.S. and France are preparing possible military action against al-Assad, and are trying at the G-20 summit to get backing from other world powers. The French official, speaking Friday in St. Petersburg, was not authorized to be publicly named according to presidential policy. we have seen before that the un was tried to be used against Syria in the case of terrorist rocket attack killing Syrian army soldiers to accuse Syria even Syria was the victim. It is easy for the force of concealment to hire, threaten or at least press the un teams to give a report with missing info and analysis leaving open doors that does not disprove the claims of terrorists. Then america will press everyone with "un justification" in its own sense. that sense the measure of replacing Syrian chemical arsenal with iskandar bm deterrence measure should be done as soon as possible. the control can be joint but also can be on Russians until a period of time but the missiles should be bound to stay in Syria with mutual agreements america should not be able to threaten or push anyone with every false flag it does to remove them afterwards leaving Syria without deterrance against isr nukes. Also the war totally reavealed from their concealment another truth which is the saudi american clown involvement with alquada and many other factions like chechen or uighur terrorists. It will be a barrier against growth of terrorism in our allies and the measure will put an end to the force of lies aim of building a terrorist caliphate or at least putting every country in the region in civil war with terrorists if possible which will be used to isolate and target each and everyone of us by american nukes after they conduct another false flag over themselves. 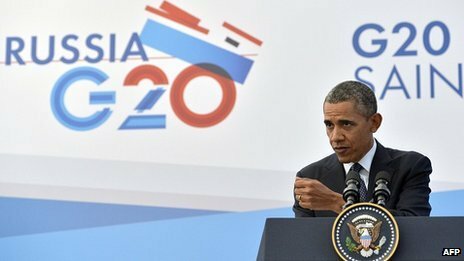 Russian and US media commentators are divided over whether US President Barack Obama or his Russian counterpart Vladimir Putin had the upper hand on Syria at the G20 summit in St Petersburg. Elsewhere, many criticise the "dysfunction" which marked the meeting. There are warnings from China that the voice of emerging countries must be heard, while two papers in the Middle East see a new Cold War taking shape. "Vladimir Putin listed those who are 'on our side'… China, India, Indonesia, Argentina, Brazil, South Africa. In other words, countries whose participation in military action against Bashar al-Assad would be hard to even imagine. Thus, if one were to describe the situation at the summit in combat terms… the victor was probably Barack Obama." "[Vladimir Putin] made it clear that he will not leave Bashar al-Assad in the lurch... It cannot be ruled out that this tough position by the head of state may influence Obama's final decision on whether to launch a military operation against Damascus." "White House officials made a point of stressing that their president arrived not in Russia but at the G20 summit. This may well be the case. Yet the mood of the summit was not to his advantage." "[Obama] must have felt very lonely in this enormous and beautiful Constantine Palace… The fact that G20 leaders were not ready to give their unequivocal support for military action against Syria and, what is more, that some were categorically against it became clear almost immediately." "President Barack Obama fell short in his bid to rally international support for a US military strike on Syria, failing to overcome divisions at a summit of world leaders before flying home to face sceptics in Congress and the American public." "The deep divisions on display here at the Group of 20 summit meeting raised the stakes even further for Mr Obama as he seeks authorisation from Congress for a 'limited, proportional' attack." "Emerging countries like China and Russia must establish their own mechanisms and ensure that the G20 operates on two wheels, both Western and non-Western. The US, despite its colossal global clout, has to pay attention to other countries." "The inclusion of the Syria crisis at the G20 may be just the beginning. More global and regional hotspots will be included on the agenda in future. The G20 will become rapidly politicised and will play an increasing, big role in building an international order. This is a major trend, and the G20 will inevitably stride in this direction irrespective of the wishes of the US and other Western countries." "The community of peoples has presented a frightening picture of its dysfunction. Even to reach a common verdict on an appalling injustice such as a gas attack seems to be impossible. Even less does a sufficiently large number of states feel called upon to debate an appropriate response to this breaking of a taboo. Selfishness on this scale on the part of states... bodes ill for the future." The conflict between the host, Putin, and US President Obama over the best response to the use of chemical weapons in the civil war-torn country overshadowed all economic issues. But even if the situation on financial markets has calmed down, there would have been an urgent need for an intense debate on undesirable economic policy developments." "Friday marked the G20 forum's first big test on a major non-financial crisis. Its performance can only be described as a failure. Not because the St Petersburg summit failed to agree on a solution to the catastrophe in Syria… No, the far graver problem exposed this week was that of world leaders palpably losing faith in the very process of international diplomacy that they are meant to be driving forward." "After a week in which the voices of opposition to punitive strikes have grown louder both in Congress and among a war-weary public, Mr Obama returned from the G20 summit in St Petersburg acknowledging that he faced a 'heavy lift' to win authorisation to use force." "French and British diplomacy having relegated themselves to the sidelines, the European Union is coming out in support of Vladimir Putin rather than Barack Obama on the Syrian issue. Such is the pitiful and pretty predictable outcome to which a series of disastrous decisions born of the completely natural outrage felt at the chemical gas attack in Damascus on 21 August has led." "Our eyes and ears are on Putin! Our prime minister went to Russia to join the G20 summit. We are in such a state that instead of focusing our attention on Obama, we have focused it on the words that will come out of Putin's mouth on Syria." "For a long time now the US administration has been talking about a hypothetical threat of chemical weapons, supposedly used by the Syrian government... And President Barack Obama now claims in St Petersburg that the aim of the attack he plans to carry out against Syria is to remove this danger… President Obama speaks of a limited attack on Syria as if he is talking of a surgical operation." "[Obama] achieved partial progress on the international level that is in his interest, starting with the Chinese, who, despite their opposition to military action, have said their position differs from Russia's in that they could not turn a blind eye to the explosive situation in Syria and the need for rapid solutions." "It is as if the Cold War was returning once more. Putin, who greeted Obama with a stiff smile and a serious handshake - a clear sign of the tension between the two - tried to exploit the elite gathering of decision makers in a palace from the era of the tsars to sway Obama from punishing the regime in Damascus." "More than two decades after the end of the Cold War, it seems that we have witnessed the shaping of a new one in St Petersburg. Besides issues such as the missile defence shield, Nato's eastward expansion and issues related to human rights, the Syrian crisis has played the biggest part in the severing of ties between Moscow and Washington... Time will tell if the Middle East turns into another Vietnam for the United States."